Tired of the same ole' jeans and t? Starting to feel like a uniform? Stop on by Joy's Uptown Style and be inspired! We carry top lines and once you try something on, you'll understand. Bring back some JOY in your casual wear ~ we've got just the right look for you! And don't forget to accessorize. 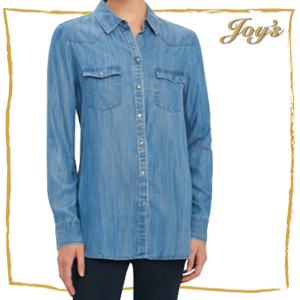 We invite you to stop by Joy's to see our full Collection. If you are seeking a trend-driven look, but value quality and fit - this Elliott Lauren Spring 2016 is the answer! Touchable Tencel Long Sleeve Blouse with classic Foxcroft Style - making exceptional oh so easy. This Pull-Over Skovhuus Strik specializes in elegant knitwear for the quality and fashion conscious woman - in all styles, colors and sizes.